Back to posting about food and wine after a short hiatus. Daughter generally spends four of her nine weeks of summer vacation in various "camps' but this year we were a little late off the mark and only found three weeks of camps that looked promising so we, and by that I mean I, decided that this summer would provide an expansion of her cooking skills. Once a week daughter and I would make a meal together, going through the whole process of menu selection, shopping, prep and finally cooking dinner, I dubbed this process Kitchen Academy . This week in Kitchen Academy, given the hot weather, I decided to focus on the grill and what better way than with Burgers. Daughter and I shopped for the ingredients together, with me explaining why extra lean beef was a bad idea for burgers (they need fat or they fall apart), and then came home to make the burgers. Everyone has their own burger recipes, some use breadcrumbs, some use raw egg, some use chopped pickles .......... I don't. My burger recipe calls for salt, pepper, dry mustard powder, minced shallot, worcestershire sauce and grated romano cheese to be added to the meat, along with a healthy dollop of bacon fat. These are gently mixed into the beef, by hand, and then formed into six, to seven, ounce balls and left in the fridge. We then prepped broccoli for roasting, trim and cut into large florets, season with salt and lemon zest, add olive oil, mix then spread on a cookie sheet, and then waited for dinner time to arrive. About thirty five minutes before dinner we preheated the oven to 450 degrees, put sliced onions in butter to saute, and lit the charcoal for the grill. We use lump charcoal so it takes twenty minutes or so for the fire to get hot enough for searing burgers, at this point wife took over as the grill is her domain, and demonstrated how to tell when the coals are hot enough and prepping the grill. Broccoli roasts for twenty minutes, turning once, burgers are cooked roughly three to four minutes a side then cheese is added and they are topped with cheese and cooked another couple of minutes with the lid on . The result is perfectly medium burgers with nicely melted cheese, last night was cheddar, as illustrated below. The wine chosen to accompany last night's burgers was a nice medium to full bodied red from South Africa Nederburg "Growers' Selection" Cabernet Sauvignon Shiraz 2010 which is currently on sale at the BCLDB for $12.99, regularly $14.99. The wine is a "FairTrade" wine meaning the grapes were sourced from fairtrade certified farms so there's a bit of social conscience involved which is an added bonus. I like the wines of South Africa as I find they tend to represent a nice balance between old world complexity and new world fruit dominant wine styles. 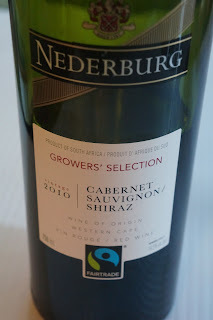 The Nederburg Cab-Shiraz is medium to full bodied with excellent red berry and black pepper in the nose and a lush mouth filling first taste, the back label says the wine spent 18 months in oak but it must have been older barrels as the wood is in the background adding a nice touch of sweet vanilla to the flavours. There's a touch of cocoa and spicebox on the finish and the finish is long and clean, the wine was drinking nicely a full hour after opening. There is limited supply on this product so I think maybe the price reduction is there to clear out stock, I would recommend buying a few bottles at the current $12.99 and keeping them on hand for the grilling season as it would be a nice compliment to virtually and meat, or poultry, off the grill.